In Star Wars: Empire at War, players controlled an entire war for the Star Wars galaxy as the Rebel Alliance or the Galactic Empire. Now, they will face off against both of them in Forces of Corruption as a brand new third faction. As Tyber Zann, players will stop at nothing as they seek to further the sinister agenda of the Zann Consortium and become the most notorious criminal leader since Jabba the Hutt. With all new tactics like piracy, kidnapping, and bribery, players can control the shadowy forces of corruption in their attempt to rule the Star Wars underworld. This (much awaited) application allows players to sync up their games to allow play between disc and Steam games. 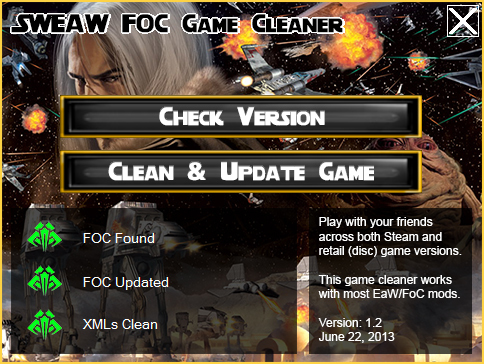 The application also allows users to remove any modified game content that will break online compatibility. It was developed by myself and will continue to be maintained, as necessary. It will continue to serve as an interim solution until an official patch is released by Petroglyph. Thank you for this program! It fixed some issues with Steam version for me. Question, if i clean and update my game will it remove all my mods? any new suggestions to not be forced to wait for a steamsale to buy it again?? ?